Born March 6, 1831, at Albany, NY, Philip Henry Sheridan was the son of Irish immigrants John and Mary Sheridan. Moving to Somerset, OH at a young age, he worked in a variety of stores as clerk before receiving an appointment to West Point in 1848. Arriving at the academy, Sheridan earned the nickname "Little Phil" due to his short stature (5'5"). An average student, he was suspended during his third year for engaging in a fight with classmate William R. Terrill. Returning to West Point, Sheridan graduated 34th of 52 in 1853. Assigned to the 1st US Infantry at Fort Duncan, TX, Sheridan was commissioned as a brevet second lieutenant. After a short stint in Texas, he was transferred to the 4th Infantry at Fort Reading, CA. Serving primarily in the Pacific Northwest, he gained combat and diplomatic experience during the Yakima and Rogue River Wars. For his service in the Northwest, he was promoted to first lieutenant in March 1861. The following month, following the outbreak of the Civil War, he was promoted again to captain. Remaining on the West Coast through the summer, he was ordered to report to Jefferson Barracks that fall. Passing through St. Louis en route to his new assignment, Sheridan called upon Major General Henry Halleck, who was commanding the Department of the Missouri. At the meeting Halleck elected to redirect Sheridan into his command and asked him to audit the department's finances. In December, he was made chief commissary officer and quartermaster general of the Army of the Southwest. In this capacity he saw action at the Battle of Pea Ridge in March 1862. After being replaced by a friend of the army's commander, Sheridan returned the Halleck's headquarters and took part in the siege of Corinth. Given command of a division in Major General Don Carlos Buell's Army of the Ohio, Sheridan played a key role in the Battle of Perryville on October 8. Under orders not to provoke a major engagement, Sheridan pushed his men forward of the Union line to seize a water source between the armies. Though he withdrew, his actions led the Confederates to advance and open the battle. Two months later at the Battle of Stones River, Sheridan correctly anticipated a major Confederate assault on the Union line and shifted his division to meet it. Holding back the rebels until his ammunition ran out, Sheridan gave the rest of the army time to reform to the meet the assault. After participating in the Tullahoma Campaign in the summer of 1863, Sheridan next saw combat at the Battle of Chickamauga on September 18-20. On the final day of the battle, his men made a stand on Lytle Hill but were overwhelmed by Confederate forces under Lieutenant General James Longstreet. Retreating, Sheridan rallied his men after hearing that Major General George H. Thomas' XIV Corps was making a stand on the battlefield. Turning his men around, Sheridan marched to aid the XIV Corps, but arrived too late as Thomas had already begun falling back. Retreating to Chattanooga, Sheridan's division became trapped in the city along with the rest of the Army of the Cumberland. Following the arrival of Major General Ulysses S. Grant with reinforcements, Sheridan's division took part in the Battle of Chattanooga on November 23-25. On the 25th, Sheridan's men attacked the heights of Missionary Ridge. Though only ordered to advance part way up the ridge, they charged forward yelling "Remember Chickamauga" and broke the Confederate lines. Impressed by the small general's performance, Grant brought Sheridan east with him in the spring of 1864. Given command of the Army of the Potomac's Cavalry Corps, Sheridan's troopers were initially used in a screening and reconnaissance role much to his chagrin. During the Battle of Spotsylvania Court House, he persuaded Grant to allow him to conduct raids deep into Confederate territory. Departing on May 9, Sheridan moved towards Richmond and battled the Confederate cavalry at Yellow Tavern, killing Major General J.E.B. Stuart, on May 11. During the Overland Campaign, Sheridan led four major raids with largely mixed results. Returning to the army, Sheridan was sent to Harper's Ferry in early August to take command of the Army of the Shenandoah. Tasked with defeating a Confederate army under Lieutenant General Jubal A. Early, which had threatened Washington, Sheridan promptly moved south seeking the enemy. Beginning on September 19, Sheridan conducted a brilliant campaign, defeating Early at Winchester, Fisher's Hill, and Cedar Creek. With Early crushed, he proceeded to lay waste to the valley. Marching east in early 1865, Sheridan rejoined Grant at Petersburg in March 1865. On April 1, Sheridan led Union forces to victory at the Battle of Five Forks. It was during this battle that he controversially removed Major General Gouverneur K. Warren, a hero of Gettysburg, from command of the V Corps. As General Robert E. Lee began evacuating Petersburg, Sheridan was assigned to lead the pursuit of the battered Confederate army. Moving quickly, Sheridan was able to cut off and capture nearly a quarter of Lee's army at the Battle of Sayler's Creek on April 6. Throwing his forces forward, Sheridan blocked Lee's escape and cornered him at Appomattox Courthouse where he surrendered on April 9. 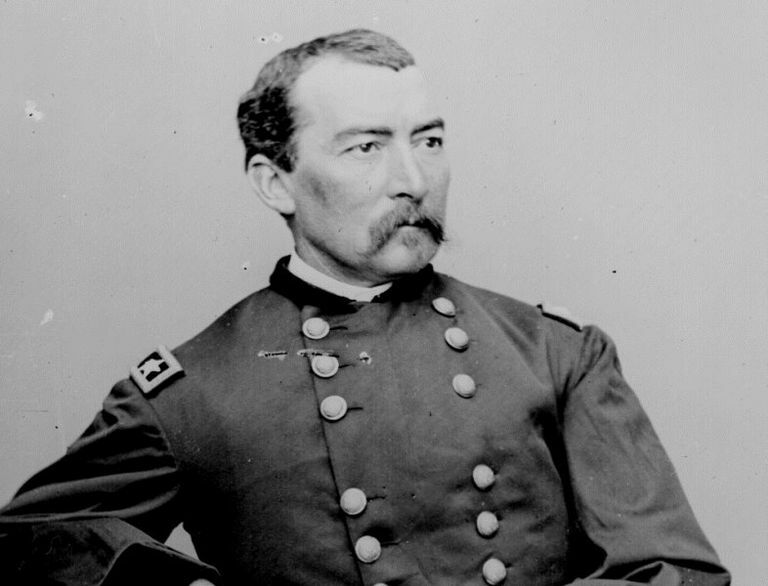 In response to Sheridan's performance during the final days of the war, Grant wrote, ""I believe General Sheridan has no superior as a general, either living or dead, and perhaps not an equal." In the days immediately following the end of the war, Sheridan was dispatched south to Texas to command a 50,000-man army along the Mexican border. This was due to the presence of 40,000 French troops which were operating in Mexico in support of Emperor Maximilian's regime. Due to increased political pressure and renewed resistance from the Mexicans, the French withdrew in 1866. After serving as the governor of the Fifth Military District (Texas & Louisiana) during the early years of Reconstruction, he was assigned to the western frontier as commander of the Department of the Missouri in August 1867. While in this post, Sheridan was promoted to lieutenant general and dispatched as an observer to the Prussian army during the 1870 Franco-Prussian War. Returning home, his men prosecuted the Red River (1874), Black Hills (1876-1877), and Ute (1879-1880) Wars against the Plains Indians. On November 1, 1883, Sheridan succeeded Sherman as Commanding General of the US Army. In 1888, at the age of 57, Sheridan suffered a series of debilitating heart attacks. Knowing that his end was near, Congress promoted him to General of the Army on June 1, 1888. After relocating from Washington to his vacation home in Massachusetts, Sheridan died on August 5, 1888. He was survived by his wife Irene (m. 1875), three daughters, and a son.